During dental visits, oral health providers ask questions to learn about the pregnant woman’s and parents’ oral health practices. For example, they may ask if the pregnant woman or child drinks fluoridated tap water or snacks frequently or if parents give the child a bottle filled with something other than water at bedtime (See Where We Stand: Fruit Juice). This information can help oral health providers deliver care and provide education to make it less likely that the woman or child will have problems later. 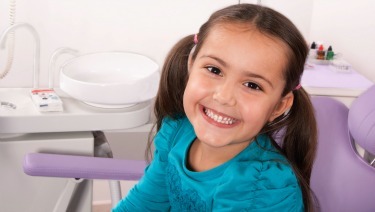 Early dental visits teach a child that oral health is important. A child who is taken for dental visits early in life is more likely to have a good attitude about oral health providers and dental visits. Pregnant women who get oral health care are also more likely to take their child to get care. One goal of dental visits is finding problems early. Tooth decay can be stopped or managed if it is caught early. Treating problems early keeps oral diseases from getting worse and costs less than treatment would later. Treating disease early is also important because oral disease can be transmitted from mother to baby through saliva. To find a dentist to care for your child visit the American Academy of Pediatric Dentistry web site or insurekidsnow.gov.